When we started today with fourteen of the world's best Omaha/Stud players, you kind of got a feeling it was going to be a special day. Any final day which features superstars such as Chad Brown, Blair Rodman, Steve Wong, Dutch Boyd, Jon Turner and Carlos Mortensen is going to produce a final table for the ages. However, it was the undeniable presence of the six-time WSOP bracelet winner that was sending whispers around the Rio. Could Ivey really make it number seven today? Two bracelets in one year? All while multi-tabling two different WSOP events! The achievement would cement his place as a legend of poker and arguably the best player in the modern game. We say this, like there was ever any doubt. At times it seemed like Ivey just couldn't be touched as he cut through the final table like a knife through butter, claiming the chip lead and the destiny that awaited him. A memorable day for the WSOP, and the buzz in the air this evening was one that those present will always remember. Thanks for your company this evening, I hope you enjoyed yourselves, and see you again soon! Ming Lee Eliminated in 2nd Place ($136,292); Phil Ivey Wins 7th Bracelet! It's over! 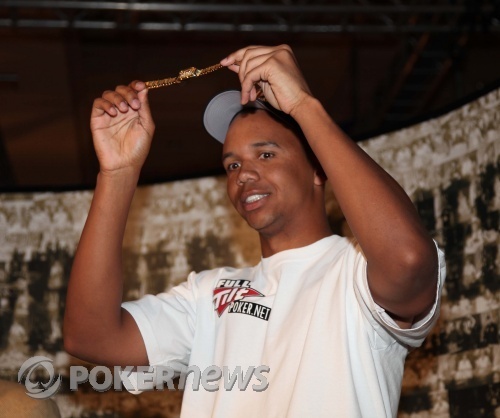 Phil Ivey has captured an incredible seventh World Series of Poker bracelet, his second this year, to the delight of the massive group of friends and fans on the rail here at the Rio. Phil Ivey made trip queens and the crowd cheered in delight at having witnessed this historic poker moment. However, we also congratulate Ming Lee, who started the day short stacked and fought incredibly well against some of the greatest players the game has seen, to finish in 2nd place for a cash of $136,292. It now appears to be a matter of time. Ming Lee has been all in three times, twice in Omaha-8 and once in Stud-8, with the pots being chopped. Lee sits with only 150,000 chips as Ivey is now taking shots to end this tournament. Ming Lee raised from the button before Phil Ivey popped it from the big blind. The flop was and Ivey fired a bet before Lee raised. Ivey called and the hit the turn. Ivey checked and Lee fired a bet. Ivey made the call. The river brought the and Ivey checked to Lee who bet, before Ivey put in a check-raise. Lee deliberated and made the call. Ivey showed for a full house to scoop and leave Lee crippled. In an Omaha-8 hand, Phil Ivey was within a spade of the bracelet, but incredibly the river was a cruel blow, giving Ming Lee an unlikely scoop. 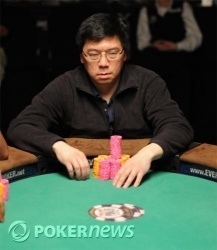 Ming Lee raised the button before Phil Ivey reraised the big blind. Lee called and they saw a flop of . Ivey led out and Lee made the call. The turn was the and after a series of raises, Lee's last chips were in the middle. Ivey held the nut low as the fans were all on their feet in anticipation of a potential spade on the river that would give Ivey a flush to better Lee's made straight. However, the twist came when the fell, to not only miss Ivey's flush but to also give Lee a better low! Lee doubles to 650,000 with Ivey on 2.15 million. After a few more small pots with the (rather significant) blinds and antes going the way of Phil Ivey, Ming Lee is now down to his last 350,000 chips. It appears Phil Ivey has slowed down just a little as he prepares his final strike. After taking a couple of small pots, Phil Ivey forced another fold from Ming Lee on fifth street in a Stud-8 hand to again have Lee in deep trouble. Ivey had completed on third, and the betting pressure from Ivey on fourth and fifth streets was too much for Lee as he folded. It was Phil Ivey's turn to raise the button with Ming Lee making the call in the big blind. The flop fell and Lee checked, then called a bet from Ivey. On the turn, Lee checked and Ivey fired again to force a fold from Lee. While there are throngs of Phil Ivey fans on the rail here, a small group of Ming Lee fans just got to clear their lungs as Lee scooped a pot to get himself headed back in the right direction. Ivey raised the button and Lee called in the big blind. They saw a flop of and Lee checked to Ivey who bet. Lee made the call. The turn was the and this time Lee led out with a bet with Ivey making the call. The river brought the and again Lee fired out a bet and Ivey called. Lee tabled for two pair for the high to go with the nut low to scoop.